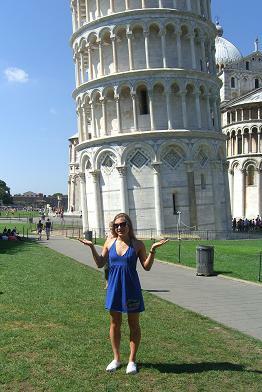 Kathryn says: We came to Pisa to do one thing – to see the Leaning Tower. We enjoyed walking around it and reading about it in our guidebook. Apparently, architects and engineers tried to correct the lean several times, and it just wasn’t happening. We joked that it was a good thing it wouldn’t stop leaning because it created a huge tourism industry here. That lean generated a lot of jobs, and a lot of creative photos. After snapping our share of photos and even a fun video, we headed to the bus stop to catch a ride to Luca. 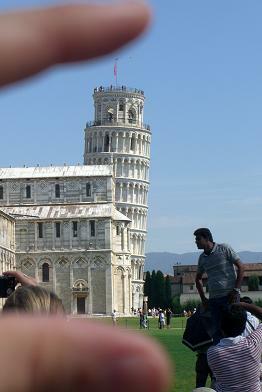 While we waited, my stomach grumbled, and I thought of a good way to appease it – pizza in Pisa! 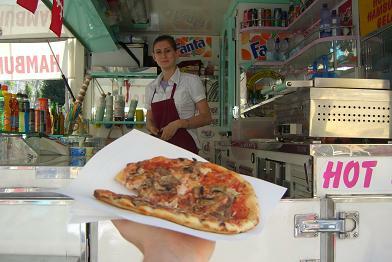 I walked over to the nearby food truck and ordered a mushroom pizza, which the cashier threw on the griddle to reheat. She cut it in half and gave it to me folded over like a panini, but I opened it up for the photo. It had light cheese and sauce and tender mushrooms on a thin, crispy crust. It wasn’t the best pizza in Italy, but I thought it was pretty cool that I was eating “a piece of pizza in Pisa.” Say that ten times fast. Kathryn says: Sometimes, you surprise yourself. 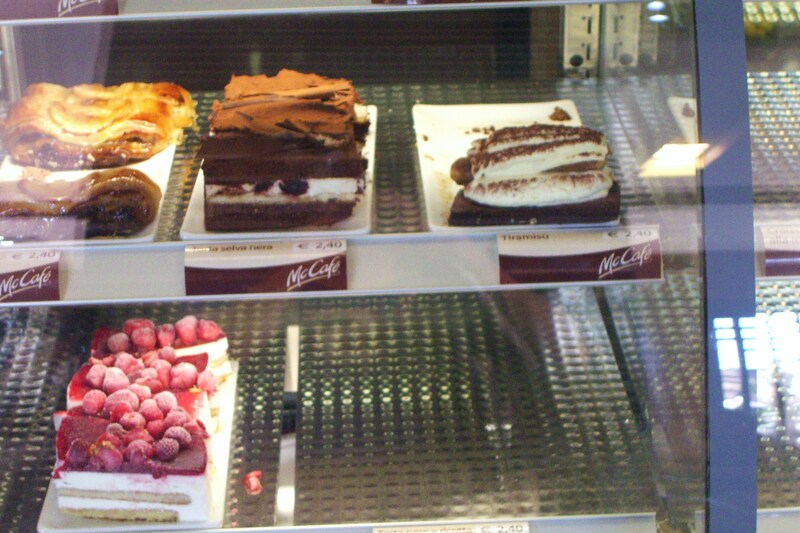 When I walked into a McDonald’s in Italy, I had one of those moments. My initial thought was that the golden arches was an American fast food chain that didn’t belong in this beautiful, ancient country of mom and pop restaurants. 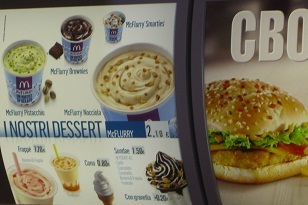 I rarely walked into McDonald’s back in the States, so why would I waste my calories (and Euros) on Ronald’s food in Italy? I mean, I could be eating gelato, right? Two words: hazelnut Blizzard. Honestly, we don’t have hazelnut Blizzards back home. And hazelnut is an Italian specialty. There I was justifying myself…and then buying a hazelnut Blizzard. When I tell you it was better than most of the gelatos I’ve tried, I mean it. Chopped hazelnuts. Creamy caramel. Smooth, soft vanilla ice-cream. It was the perfect, cool treat in the mid-afternoon heat. I have a new appreciation for McDonald’s in Italy.